For Christmas, April and Perry gave me a Steak 'n Shake gift card. On Tuesday, Pam and I went to Steak 'n Shake. We had not gotten together since early December. She works at a charitable organization and the end of the year is always one of her busiest times with last minute "I want to donate some money" gifts coming in. I know how irritated I can get when I have all my tax information EXCEPT that one piece of paper from some organization to whom I have donated money. Then I listen to how much work Pam has to do to make sure everything is done in compliance with both tax laws and her employer's standards and we joke that we won't see her from mid-December until mid-February. "I think she's under that stack of papers over yonder." This really is the kind of thing that can't be automated. It takes a real person to make sure the $40 I give gets acknowledged and then filed with the IRS and whatever else the organization does with it. All day I was thinking about the food I would have. I had it winnowed down to chicken fingers and their bacon cheese fries. Yes, yes, yes. I know bacon cheese fries are hardening your arteries as you read this. BUT, I eat these maybe once every 6 months, if that. I think I would hate them if I suddenly had the urge to eat them even once a month. They are quite fat-filled but as a rare treat, they are acceptable. It is debatable if the yellow stuff is real cheese or a cheese-flavored something or other, but they taste good, again, once or twice a year. 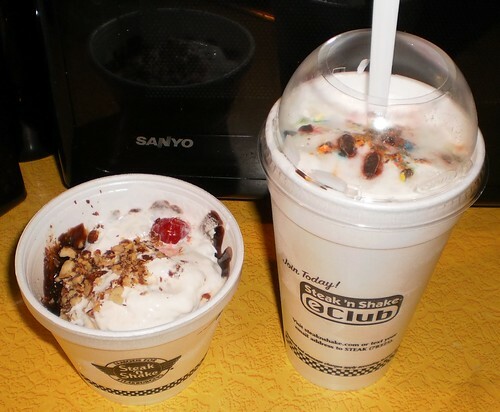 Karma was good to me and the mail brought a Steak 'n Shake flyer with coupons. The end result was that I could get a sundae free and my chicken fingers and bacon cheese fries at $1.50 off the regular price. That alone paid for the shake; M&M, if you please. I had to bring both home because, honestly, I was full after three large pieces of breaded chicken breast and the baconist, cheesiest fries I've had in awhile. The shake was consumed during WOW while we killed a dragon. I wound up saving the sundae for the next day. I was too full. It was kind of mushy the next day but I liked it because it was free. Pam and I got caught up on everything, so we are set now until probably the end of March. I love having friends like this where each meeting is a 'pick up where we left off' one, filled with laughter. Our server at Steak 'n Shake was really good, too. Just attentive enough without our feeling that he was hovering. So, thank you April and Perry. You made both of us very happy.